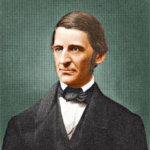 In recently reflecting upon Emerson’s words again, I thought about how peaceful and wonderful it is to be “in the middle of the stream of power and wisdom” that brings us “a perfect contentment”–even if for only a few moments at a time. His words are such a poetic expression of the strong correlation—and dynamic–between letting go of control and living within the abode of power, wisdom, and contentment. My book’s title Losing Control, Finding Serenity is intended to reflect that correlationship. Simply put, control obstructs the “stream” of life’s natural currents. You can’t flow when you control. That’s why I write extensively in the book and in this blog about the catalysts and causes of our controlling actions and how we can overcome them. Our fears about all the “what ifs” and “what might happens” cause us to hold on tightly, to “grip” life’s natural currents. As such, much like gripping a moving conveyor built, we either get “burned” or dragged along. Fears are almost always illusory and don’t like being exposed for what they are–cowardly. Don’t make assumptions or speculate about the future negatively. Instead, address what is real for you today and trust that you will be able to handle what tomorrow brings–tomorrow. In doing so, you will reduce your compulsion to control and thereby place yourself in the middle of the stream of power, wisdom, and contentment. And what a great place to be! Let’s Help Make Acceptance Go Viral! *If you enjoyed this post, please “like” it on your Facebook page and share it with others.